DePaul > Blog > Mental Health > What’s Cooking at DePaul ? There are more than good smells emanating from training kitchens in a number of DePaul’s mental health programs in Western New York. In addition to learning cooking skills, clients are practicing vocational and social skills that are valuable on their road to recovery. 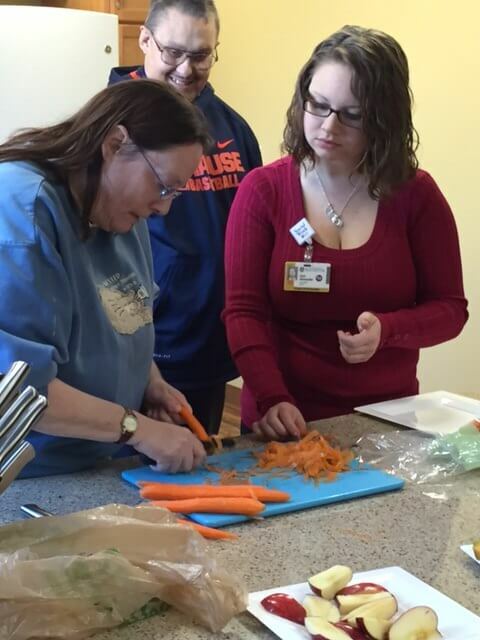 Rochester View Apartments residents Monica and Barry learn how to peel and cut carrots with Sara, an intern with the University of Rochester’s Deaf Wellness Center. Interns from the University of Rochester’s Deaf Wellness Center (DWC) have been leading residents who are Deaf and hard of hearing at the Rochester View Apartments (RVA) in Henrietta, New York, in bi-weekly cooking classes covering food safety, proper ways to handle cutting knives and more. Fifteen residents participated in the first class which involved learning how to peel and cut a variety of fruits and vegetables. “This is a useful experience for residents because they come together and practice hands-on cooking skills which can be applied in their daily lives,” said RVA Property Manager Denise Fry. In December, the smell of Christmas cookies wafted from the training kitchen at Kensington Square, a DePaul Single Room Occupancy Program in Buffalo, New York. A peer-educator from the Restoration Society led residents in a lesson on holiday baking. Formal cooking classes will begin soon. “This is a valuable addition to Kensington Square as it gives residents a chance to learn or relearn the skills necessary to move on to a more independent apartment where they can cook for themselves,” said Program Director Jill Schmidt. Residents at DePaul’s Ridgeview Commons Treatment Apartment Program in Rochester, New York have utilized their training kitchen for a number of classes offered through Foodlink. Most recently, they’ve learned how to properly store food in the refrigerator, healthy nutrition habits and how to prepare meals on a budget. “The training kitchen is a valuable resource in a client’s road to recovery because it teaches them how to properly prepare meals, and how to utilize cooking as a coping skill,” said Program Manager Rebecca Barnes. 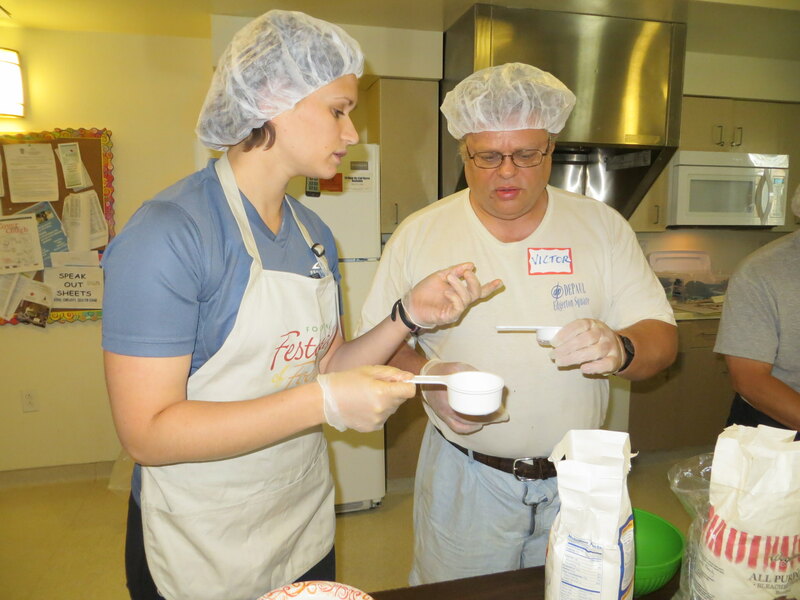 Pictured left, April Miller of Foodlink works with resident Victor W. in the kitchen at Ridgeview Commons. At Seneca Square, a Single Room Occupancy Program in Buffalo, New York, about 20 residents have been working on everything from basic kitchen safety to identifying and following recipes. Residents have prepared various desserts in “Baking with Brandy” classes, led by Community Living Supervisor Brandy Mathis. In December, Seneca Square began hosting ‘open night in the training kitchen’ available to any residents who want to bring in food to cook. 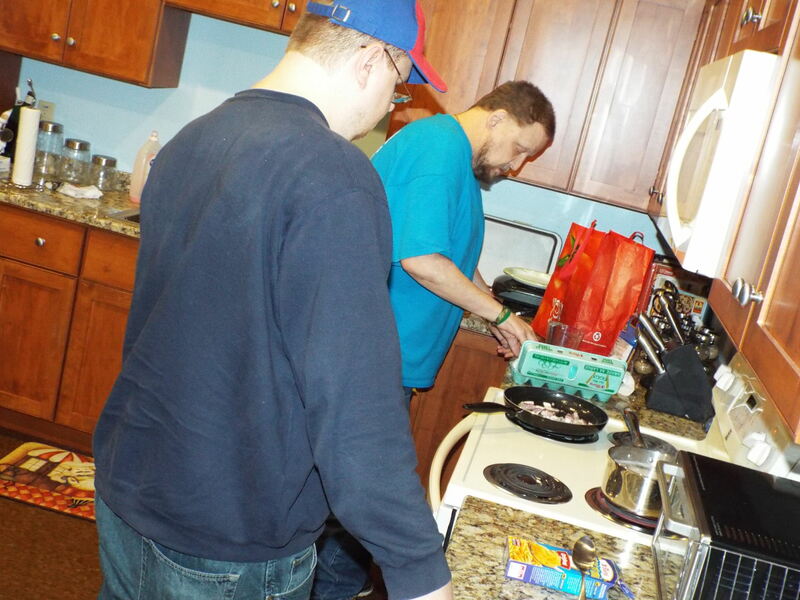 Seneca Square residents Erick K. and Clinton H. prepare food in the community’s training kitchen. “It’s a great opportunity, as they have the benefit of staff being present to help them with anything they may need and other residents can learn from the experience as well,” said Program Director Heidi Augustyn. Enrollees in DePaul’s Personalized Recovery Oriented Services (PROS) program are using the training kitchen at DePaul’s City Center in Rochester, New York to learn skills that are valuable on their road to recovery as they develop vocational and social skills necessary for living independently. The purpose of all recovery units, including the kitchen, is to practice skills used to effectively manage symptom-related barriers, so they can get and keep jobs, said Program Director Kathy Curtis-Rubin. 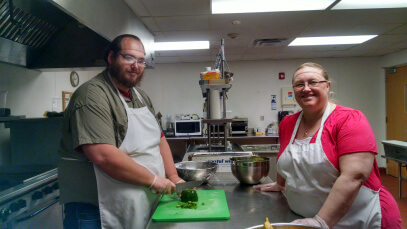 Pictured above, PROS client Thomas B. works with Dietary Director and Office Manager Pam Maglier on a cooking lesson.